The Creative Mind of “The Late” Dr. David Lady! 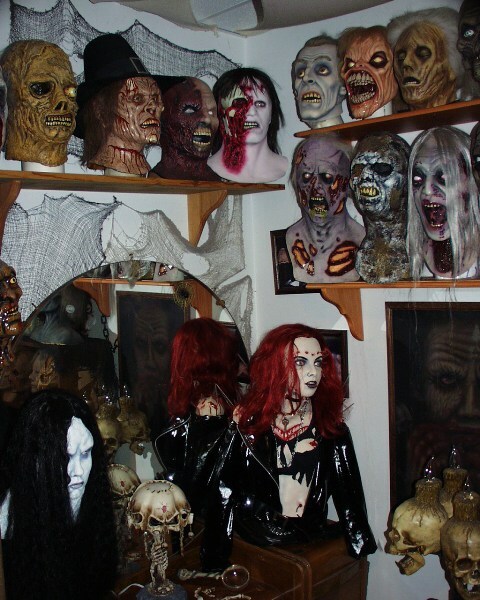 If you are a mask collector then more than likely you have heard the name David Lady at least once (and more than likely you actually know him and have either talked to him on the phone or have e-mailed with him). When I first became aware of David it was in the late 1980’s. At the time the big mask companies were Don Post Studios, Distortions Unlimited and Be Something Studios. Though I bought masks from all 3 companies, a trend was starting to develop where what you got greatly differed from what you were ordering from their catalogs. So, I started to look for other options and found companies like Death Studios and one of my all time favorites, the now defunct House Of Horror Studios. In my quest to find better quality masks I came across a group called The Halloween Society. This society, run by Ron Magid, Dante Renta, Guy Thorpe and yes, David Lady, introduced me to a whole new area of collecting…an area I was unaware of. 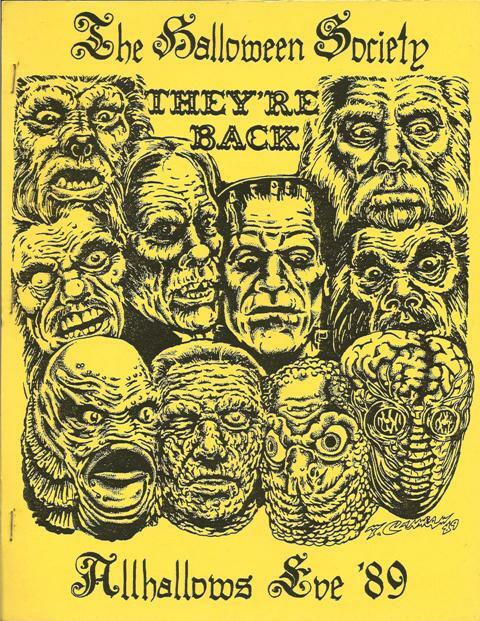 Apparently there were artists out there creating limited edition masks and busts of all of the great monsters I grew up on and it was through The Halloween Society’s magazine “The Halloween Gazette” that I started to see these pieces being offered. “The Halloween Gazette” was an informative and very fun magazine to get. 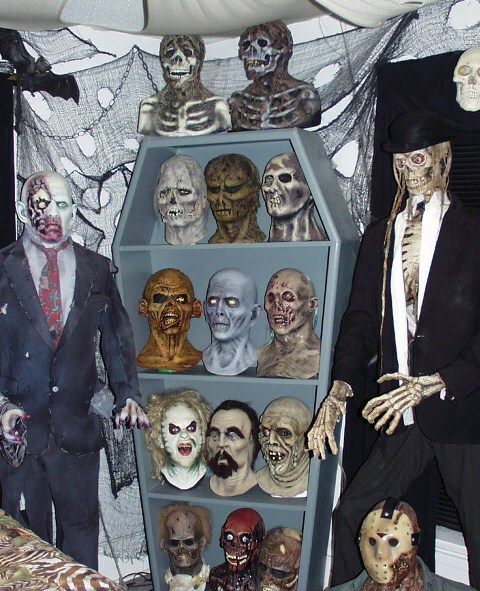 Not only did it do spotlights on the various mask companies, but it also covered the limited editions being produced, some of which were actually commissioned and released by The Halloween Society themselves (and which are highly sought after collector’s items today). In addition to promoting these companies and pieces, there were also movie reviews, costuming tips (like how to make your own mummy costume) and pretty much anything having to do with Halloween masks. 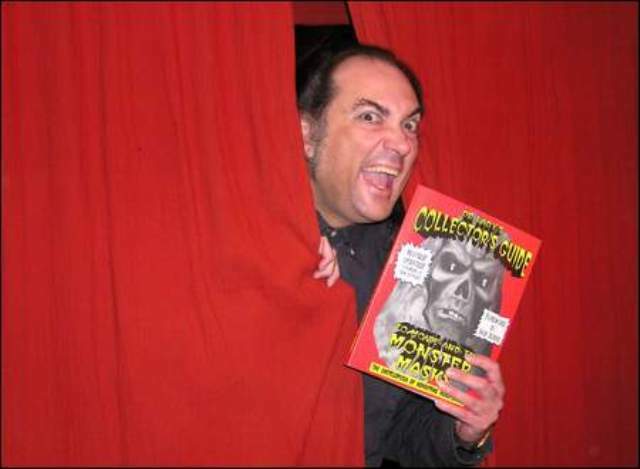 One of my favorite things in the magazine were the classified ads…sure they weren’t as cool as the Captain Company ads in the back of “Famous Monsters Of Filmland” but the ads introduced me to other mask companies…and David Lady. An original ad by David Lady from “The Halloween Gazette”. 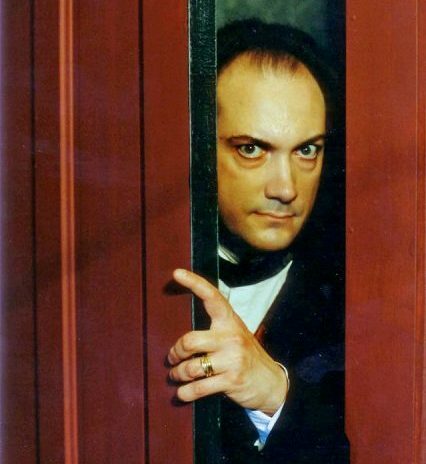 One of the reasons I was drawn to David was because he was so prominently featured in “The Halloween Gazette”. Not only did he write articles and provide photographs from his impressive collection, but he also did a lot of the original artwork and always had ads of masks he was selling. Being a zombie fan, and seeing that his Deadalus and Bonaparte masks were only $30, I immediately ordered them and that started a friendship that has lasted to this day. It was obvious from the start that David was the go to guy in the mask collecting world. 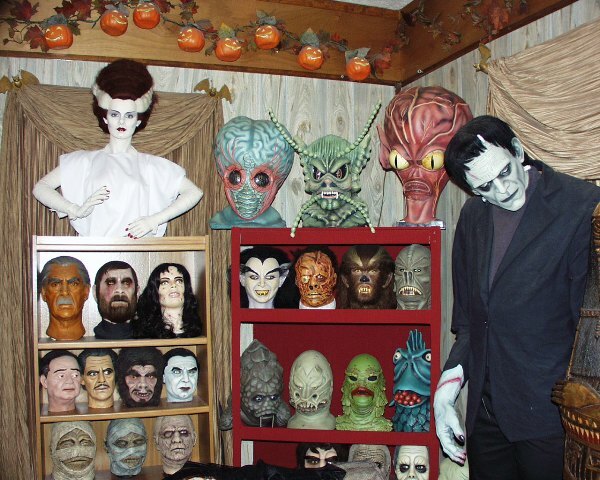 Not only does he have one of the most impressive mask collections around, he is also the most knowledgeable person on the subject of Halloween masks and busts that I know of. David Lady is one of the nicest people you will ever meet. Phone conversations with him are always filled with laughs because of his quick wit and subtle sense of humor. Our friendship developed quickly and in 1991, my then girlfriend at the time and I went to visit David, his wife Laura and his friend Guy Thorpe in West Hollywood for a week. We did the normal West Coast things…Disneyland, Universal Studios, celebrity house tour…but the highlight was definitely the time spent with David. He was the perfect host and kept us entertained the entire week showing us many famous Hollywood locations and fun stores. Each evening we would all gather together in Guy Thorpe’s hearse and cruise Hollywood, visiting various locations and eating at fun restaurants. Two that stand out in my mind were The Spaghetti Factory and Ed Debevic’s, a 50’s style diner where you interact with the waitresses and they would actually yell at you if you didn’t eat all of the food off of your plate. 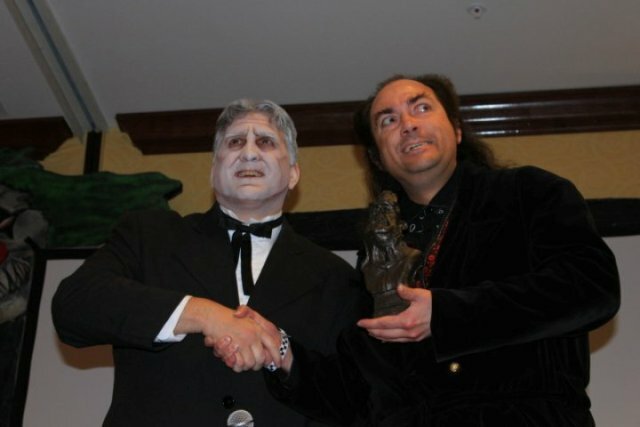 One day he introduced us to Daniel Roebuck, actor and fellow mask collector (Daniel has been in many movies including RIVER’S EDGE, THE FUGITIVE, THE DEVIL’S REJECTS and BUBBA HO-TEP). He even brought us to Bronson Canyon, the site seen in so many science fiction movies of the 50’s as well as the 1960’s BATMAN television series. One of the nicest nights was near the end of the vacation where we just hung out at David’s apartment, watched music videos on MTV (yes, MTV used to actually show music videos) and discussed masks, monsters and horror movies. Since that visit to West Hollywood, David and his lovely wife Laura have moved back to their hometown in Ohio. 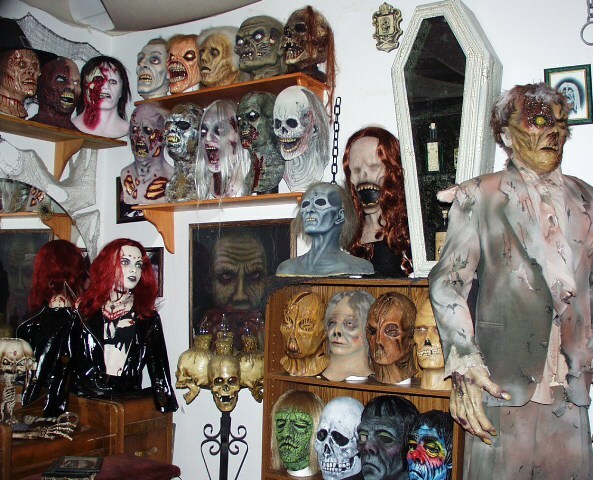 David continues to make masks (with Laura doing the intricate hair work), he does his own haunted attraction (Horror Hotel), he has his own horror host show (The Late Dr. Lady Show) and is mayor of his town! He has also authored books on making masks as well as the only picture guide to collectible masks. It’s not often that you hear of someone being able to do something they love so much as a career but David has done it and he is one of the reasons that I find mask collecting so fun. Even though he is very busy he is always willing to take the time and discuss his true love…monsters. This is what makes David such a classy guy…there is no ego and he genuinely loves and appreciates his friends and fans of his work. David was also generous enough to do a Q & A with me and I am going to share that with you now, as well as some pictures he provided of his amazing collection! ENJOY! DAVID A: Were you always interested in monsters? DAVID L: Only since birth. I don’t recall much about childhood, but the first things I remember owning were a poster of Bela Lugosi as Dracula, which I loved, especially since my evil grandmother hated it, and a Monster Colorforms set my mom bought me. It was a little mad scientist lab, with a green monster you could put together and a hairy-faced guy who may have been either a mad doctor or a wolfman. DAVID A: What are some of your favorite monster movies? DAVID L: I have too many favorites to list! A few that come immediately to mind are FRANKENSTEIN, THE BRIDE OF FRANKENSTEIN, DAWN OF THE DEAD, CREEPSHOW, PHANTASM, THE ABOMINABLE DR. PHIBES, HORROR OF DRACULA, the original three STAR WARS movies and tons of others. DAVID A: What was the first mask you ever bought (or was bought for you)? DAVID L: My first truly high-end, collectible mask was a Don Post Creature From The Black Lagoon. My first full-head mask of any kind was probably a ripoff of the Don Post Wolfman made by the old Traveler’s company. He had black fur and he came from a store called Helen Gallagher Gifts, which later became Spencer’s. Before that I had some cheapies like Ben Cooper plastic masks and some badly-made Topstones. DAVID A: Were your parents supportive in your love of monsters? DAVID L: I think my dad was always disappointed that I didn’t get into the same things he liked, such as football, cars and beer. But he never tried to discrouage me from doing whatever I liked. My mom was VERY supportive! Her birthday is Halloween like mine (um… different years, of course; Mom was born first), so I always got masks and spooky toys as birthday presents. Mom always bought me Don Post masks for Christmas and other occasions. She’d order them from the Captain Company ads in Famous Monsters magazines, and when we took summer vacations I’d always get a Don Post mask from the magic shop at Disney World. I had this really wonderful great-aunt and uncle too. Aunt Ruth bought me my first subscription to Famous Monsters and, being a wonderful cook, she made me and Mom a special birthday cake every year with a witch or a black cat or a monster of some kind on it. Uncle Chuck would always wrap my birthday and Christmas presents, using a rubber bat or spider or skull instead of a bow. Now that I think about it, that might have started my love of customizing everything with a macabre touch. Aunt Ruth and Uncle Chuck were two of the most kind, thoughtful, intelligent and pleasant people I’ve ever known, and I miss them all the time. They were my mother’s aunt and uncle, so I already thought of them as “old” when I was little. DAVID A: What started you in mask making? 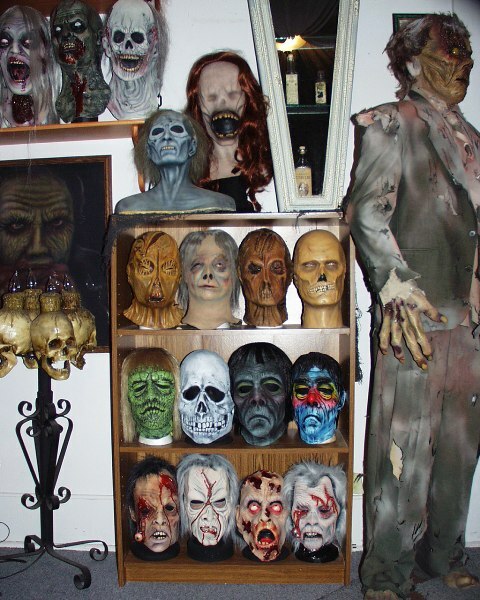 DAVID L: A friend, Chris Striker, used to come over and see my masks all the time, and helped in my annual Haunted House. At some point he asked me why I wasn’t making my own masks, since I was already an artist-illustrator and obviously loved masks so much. He said I should come over to his garage and try using this old airbrush he had, which he wasn’t using anyway. Pretty soon I ended up buying some plaster and clay and liquid latex and so forth and went over to Chris’s to make a shambles of his garage. I had fun trying things out and learning to sculpt and paint and all. Pretty sure I broke up Chris’s first marriage, too. DAVID A: Were you self-taught when it came to sculpting, molding and painting? DAVID L: Yes, mostly, but only because there wasn’t anything much available as far as mask-making instructional reading back then. Remember, this was in the 1980s, before inventions like the Internet, cell phones, or the wheel. I think James K. Polk was President. So, yeah, there was a lot of trial-and-error involved. Particularly error. DAVID A: It’s not often that someone can make a career out of something they love. What are some of your fondest memories of mask collecting or mask making? DAVID L: The great thing is, every time I get a new piece today, it’s still just as cool and fun and exciting as it was when I was a kid. My motto is “we can’t stay young, but we can stay immature”. 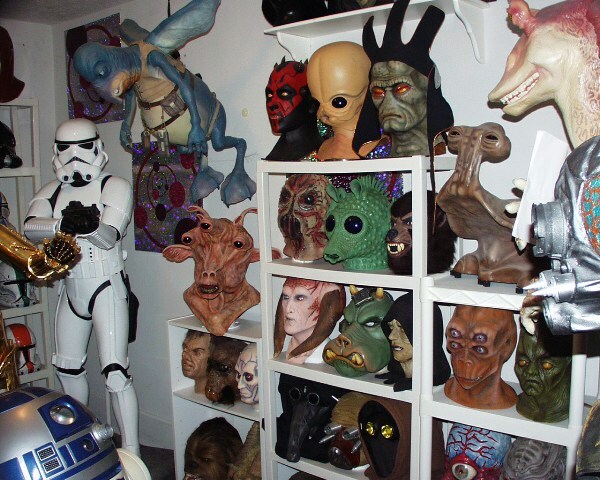 DAVID A: If you could only choose one favorite mask of all time, which one would it be? DAVID L: Hard to say. No, make that “impossible”. 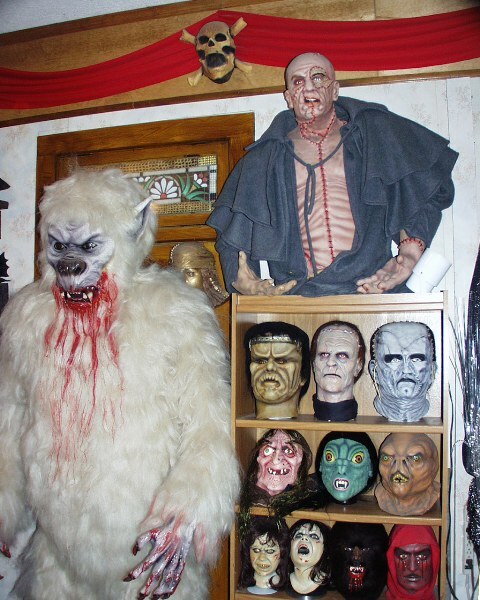 But a few of my all-time faves are the Don Post Frankenstein, Mummy and Creature masks, Distortions’ Pickman’s Model, Harry Inman’s Shuna Sassi, the movie-mold Darth Vader helmet, the Halloween Society Metropolis and Golem busts, as well as some ‘generic’ ones like B. Garret Theta, Erik, and… oh, I should quit now, huh? DAVID A: Is there one character that you still hope gets made into a mask/display bust someday? DAVID L: No, there isn’t one. There are DOZENS. I’m waiting for someone to do masks of Octa-Man, Zaat, Stephen King’s Night Flier, the zombie from DR. BLOOD’S COFFIN, the dead witch from BLACK SABBATH, Onslow Stevens as Edelmann from HOUSE OF DRACULA, Clancy Brown as the Frankenstein Monster from THE BRIDE, Dr. Caligari and Cesare from the silent CABINET OF DR. CALIGARI, Tessek the Quarren from RETURN OF THE JEDI, and also Luigi Montefiore/”George Eastman” as Klaus the cannibal ghoul from THE GRIM REAPER, Ewa Aulin’s rotted corpse face from DEATH SMILES AT MURDER, the Cthulhu-looking guy seen near the end of DAGON, Mystique from the X-MEN movies, and probably dozens of others. It’s frustrating that so many mask artists keep doing the same things over and over, like more Michael Myers and Universal Frankenstein masks, which have been done to death-and-beyond by now. I hope to see some new blood. DAVID A: What would you consider to be your greatest influence(s) in doing what you do? DAVID L: The old Don Post mask ads I’d see as a kid and all the old monster movies I used to stay up late and watch on TV, back in the days when TV was still interesting and entertaining. 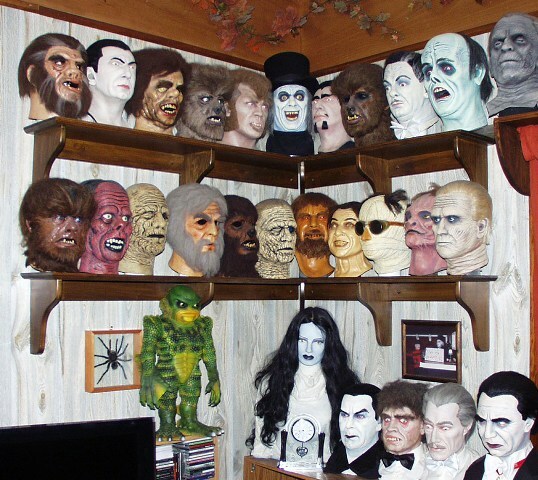 DAVID A: How many masks/display busts do you have in your collection now? DAVID L: I don’t know the exact number but it’s over 500. 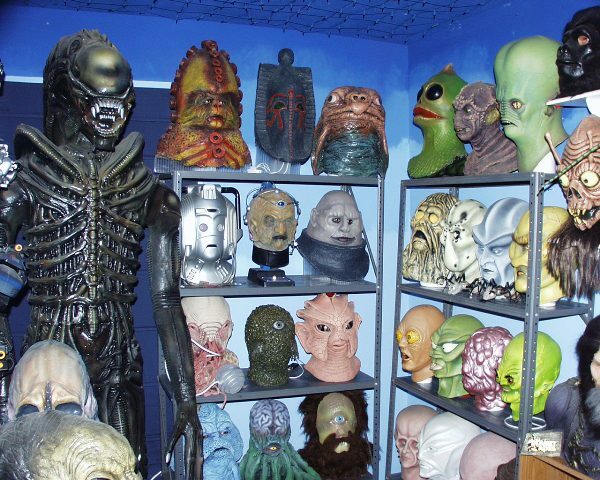 DAVID A: Is there any mask, past or present, that you never got and totally regret that it’s not in your collection? DAVID L: None that really bother me. Although there are a lot of old ones I used to have that I miss. 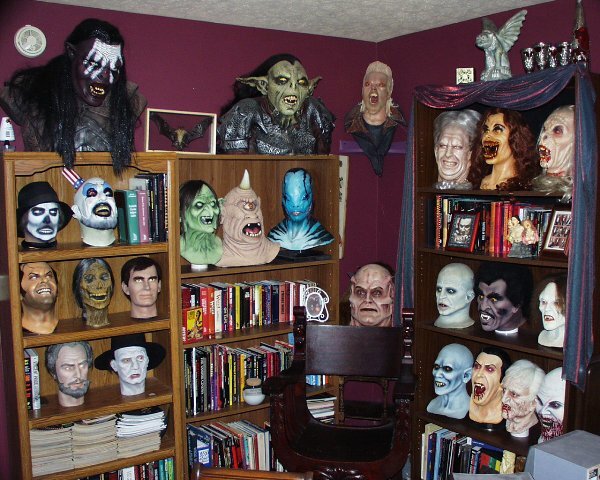 DAVID A: Do you have any recommendations for anyone who is interested in either mask collecting or mask making? DAVID L: It would probably be very crass and tacky to say something shamelessly self-promoting like, “Buy a DR LADY mask!”, so I won’t say that. 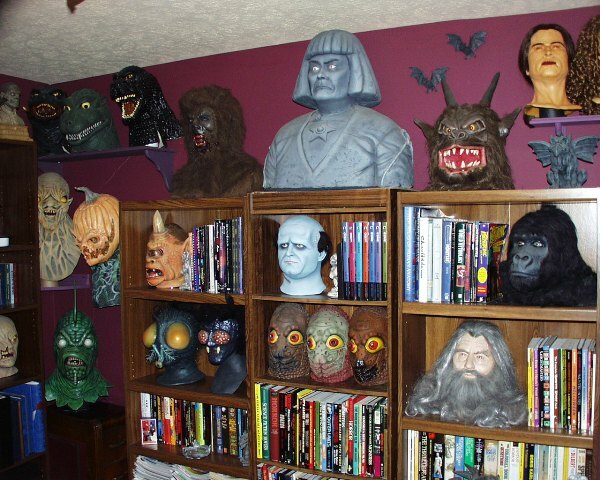 It would probably also be tacky to mention that I still have a few copies left of my world-famous, earth-shattering, legendary book DR LADY’S COLLECTOR’S GUIDE TO MOVIE & TV MONSTER MASKS, available through my website. Come to think of it, I suppose it might also seem too self-promoting to say that I also wrote a mask-making handbook called EXTREME MASK MAKING: A HOW-TO GUIDE FOR HUMANS, which is loaded with useful information and is also available from my website, which is also where folks can see lots of pictures of our mask projects, Horror Hotel tours, and other fun stuff. But I probably shouldn’t mention any of that, huh? I wouldn’t want to sound crass or anything….. I want to thank David Lady for taking the time to answer these questions and for providing the amazing photographs used in this article! If you would like to buy the books he mentions you can click here. If you would like DVD’s of his show The Late Dr. Lady Show or his latest release, Dr. Lady’s Monstrous Mask Photo Archives, you can click here. To see what masks he is currently offering for sale click here. If you want to order his cd’s click here. This entry was posted in Horror Hosts, Masks, Models, & Props! and tagged BATMAN, Be Something Studios, BRIDE OF FRANKENSTEIN, Bubba Ho-Tep, Colorforms, Creepshow, Daniel Roebuck, Dante Renta, David Lady, DAWN OF THE DEAD, Distortions Unlimited, Don Post, Don Post Studios, Frankenstein, Guy Thorpe, Horror Hotel, Horror of Dracula, House Of Horror Studios, Laura Lady, masks, Monster Masks, Phantasm, River's Edge, Ron Magid, STAR WARS, The Abominable Dr. Phibes, The Devil's Rejects, The Fugitive, The Halloween Gazette', The Halloween Society, The Late Dr. Lady, The Late Dr. Lady Show, Wolfman. Bookmark the permalink. ← Organizing Your Horror DVD/Blu-Ray Collection! Great article and interview! A big thanks for all the great mask info and pictures. I am disappointed that my local cable in ma. scts has not aired any more late dr. lady shows for the last two months, I always looked forward to dr. lady and his crew.